Today on Decorating Tips and Tricks we are talking about ways to ELEVATE YOUR HAPPINESS EVERY DAY when it comes to living in your home. This is a great episode and one to listen to over and over again! 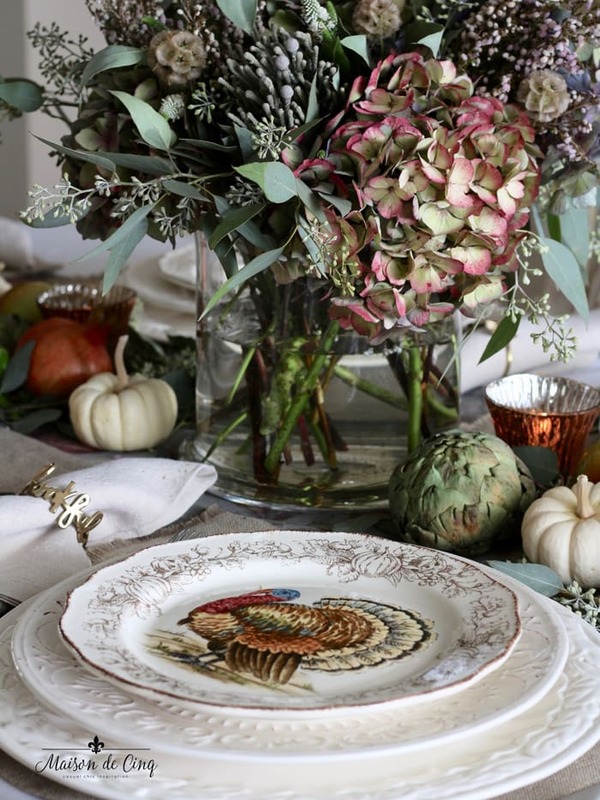 There are 20 very talented blogger’s sharing their Thanksgiving ideas and tables with you! A big thank you to my friend Lory at Designthusiam for getting all of us together! Welcome everyone! Especially if you are coming from CITRINE LIVING. 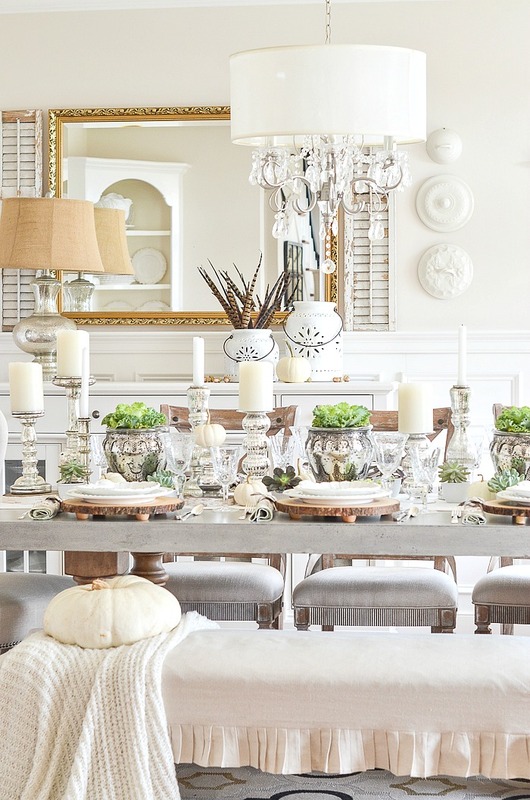 Tamara has a gorgeous blog and her table is just another one of her amazing masterpieces! 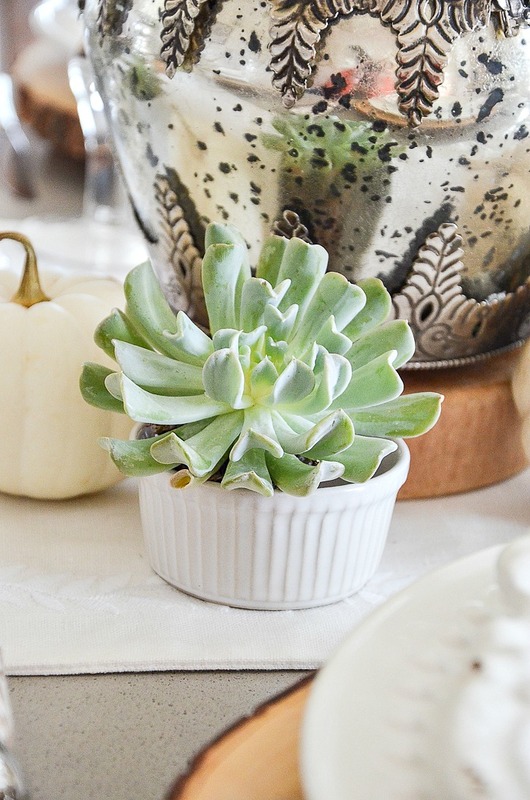 Here are some easy to do ideas for YOUR Thanksgiving table! 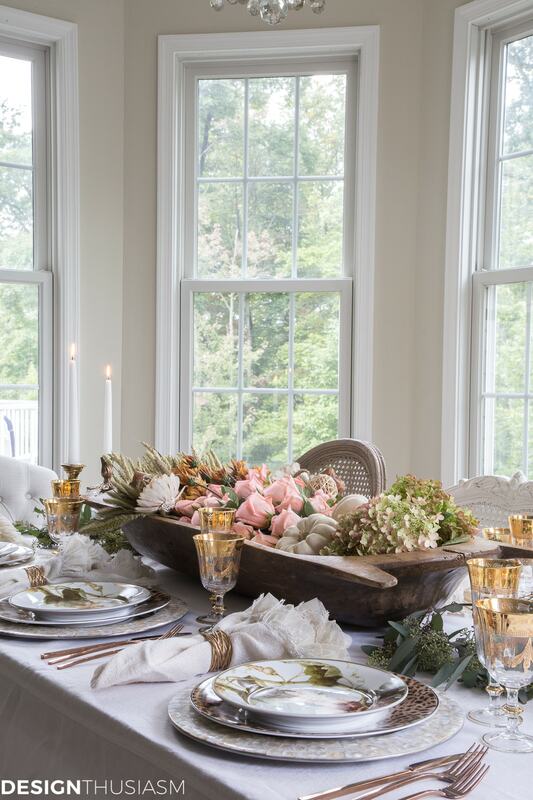 One of the biggest designer secret for setting a beautiful table is to start with a color scheme. 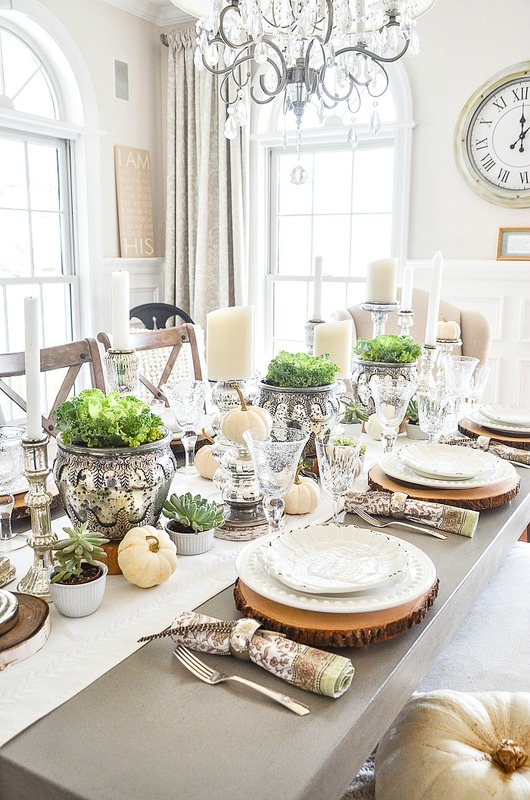 Choosing two or three main colors will go a very very long way for set a cohesive and attractive table. Starting a table by thinking of “color” is a great way to start a successful table! 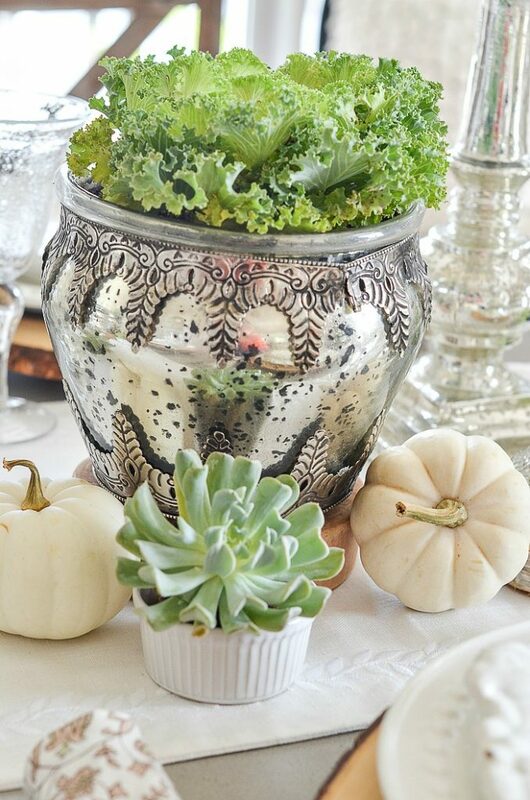 My Thanksgiving table this year has lots of white, a little bit of green and some shiny silver! Very serene, organic with a little bling… well, maybe a lot of bling! 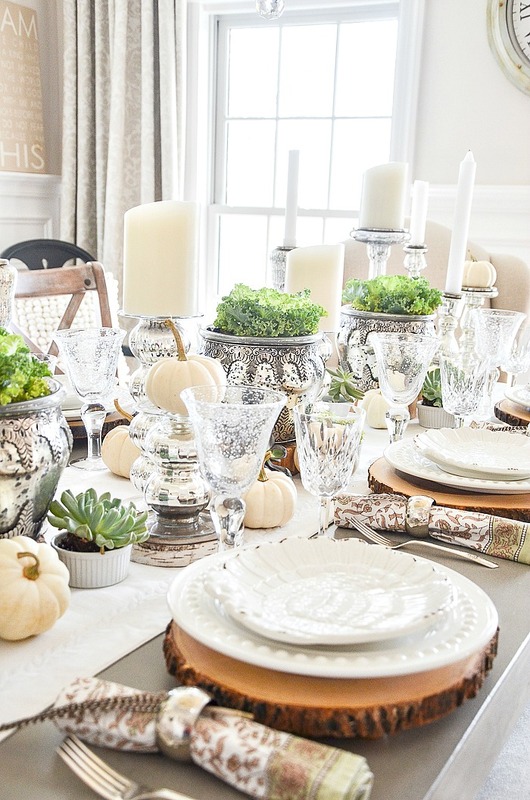 I think using the same pattern dishes, glasses and flatware is just a tad boring! 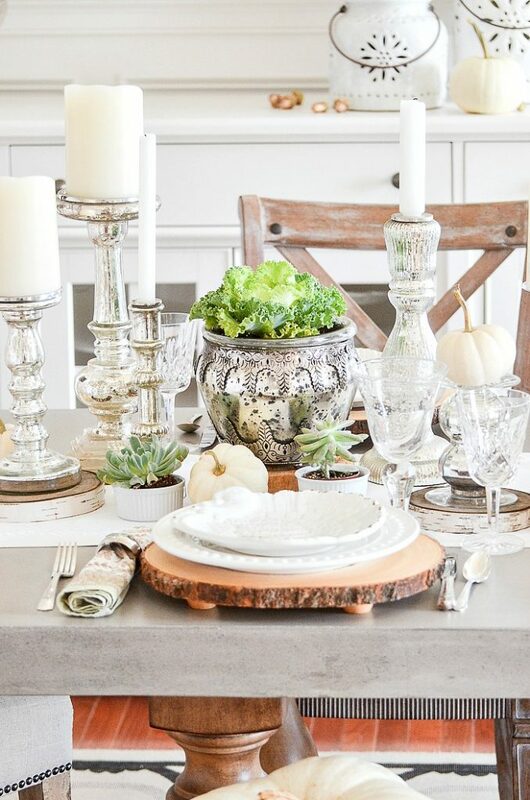 Mixing your tableware up is a fabulous way to use them in fun and fresh ways. Play and try different combinations. I like to do this with my flatware too! 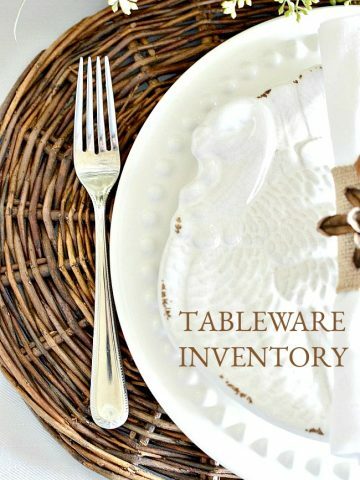 There are three different silver-plated flatware patterns at each place. How interesting, right? Repeat, repeat, repeat! Another BIG secret of a fabulous table! And make sure these elements are repeated around the whole table. Like most tables I set I think of the word “juxtaposition”. It’s when two things (or more) are placed next to each other with contrasting effects. Think lux/rustic, high/low, formal/comfortable. I love the creative tension juxtaposition creates. 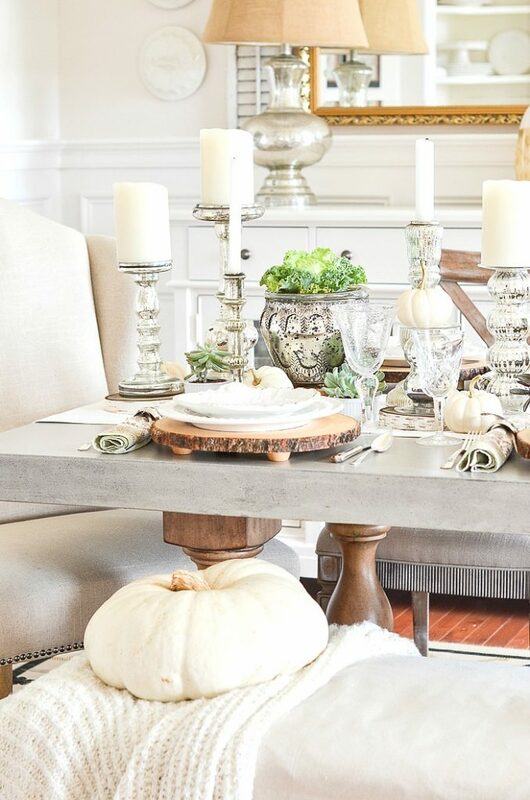 Silver/rough wood is evident on this table. Okay, this is just a personal thing. I love a crisp white tablecloth but I don’t like ironing them and I really don’t like trying to get stains out of them and I really, really don’t like to pay for dry cleaning them! 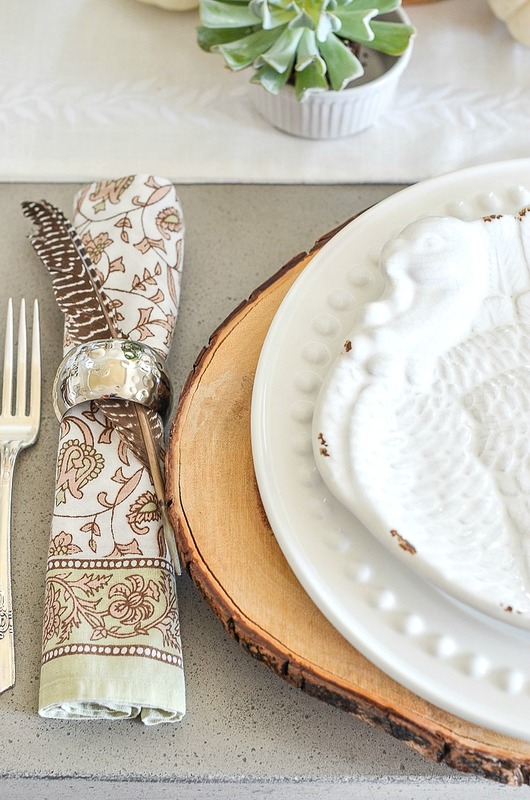 Saying that, If I ever did use a tablecloth it would probably be for Thanksgiving and Christmas dinner. I often opt for a runner and placemats or chargers! So much easier and I think a nice bridge between formal and comfortable. This Thanksgiving I’m using these really well made and fun log slices as chargers. They even have tiny feet to get them up off the table. I use them in the fall every year! They also work great under plants and as risers. Don’t you love things with multiple uses? Every table you set should have something organic on it! 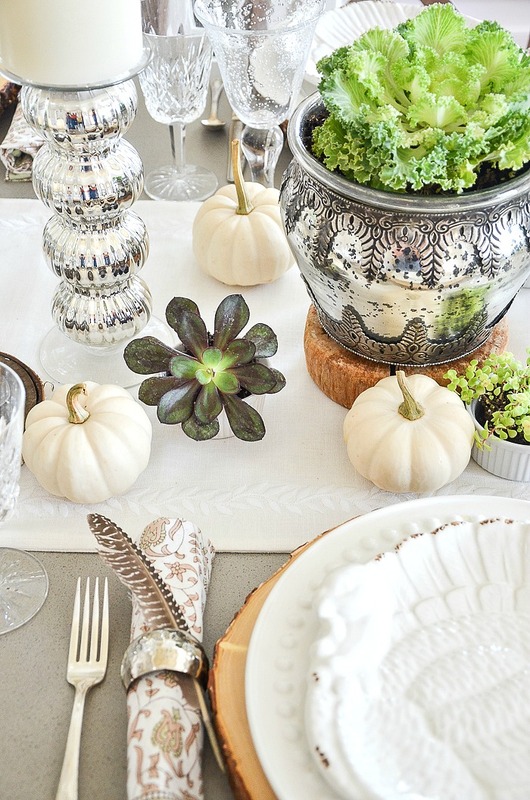 Here are some ideas for Thanksgiving. 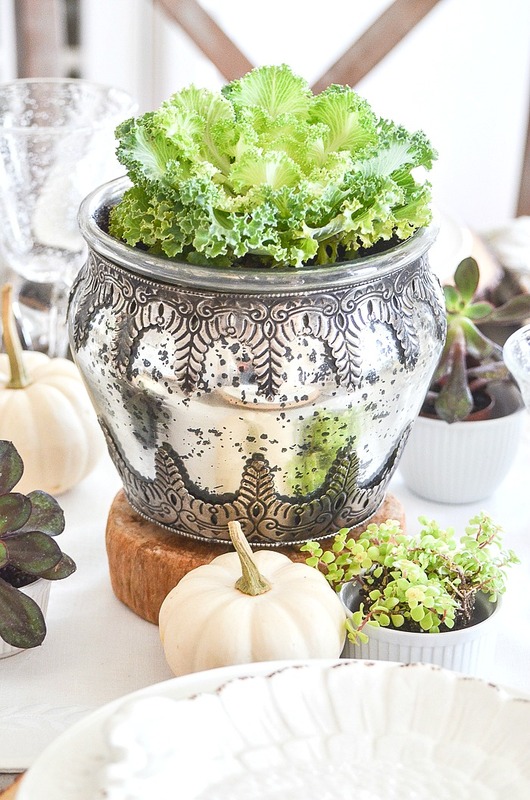 Combine some of these into a pretty centerpiece or have them run down the center of your table! Just use them! 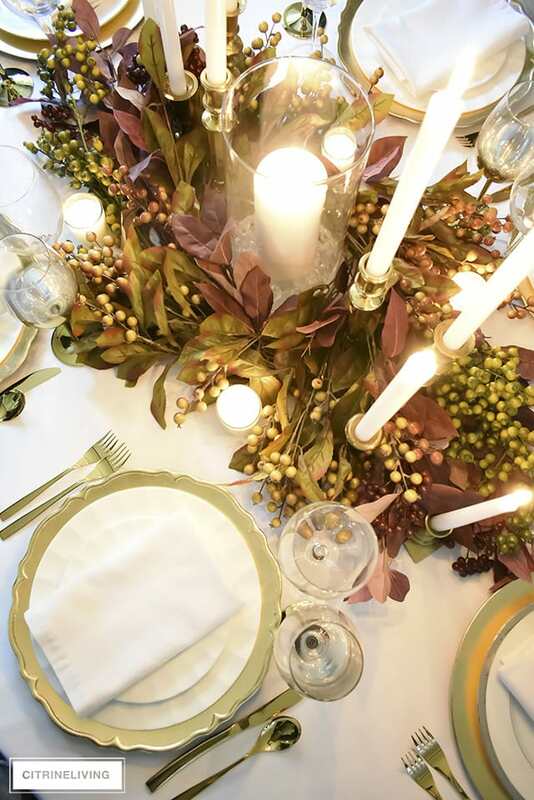 Since it gets dark early, let’s let candle glow be part of the beauty of a Thanksgiving table! 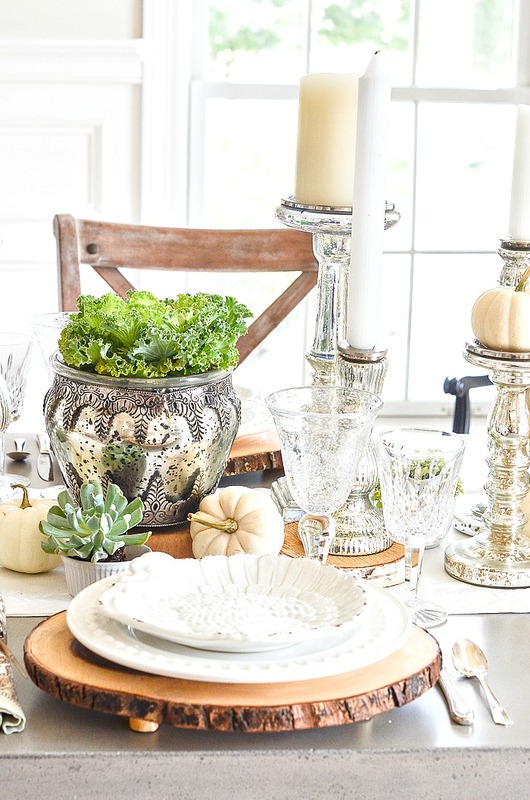 And don’t be shy about using them especially if they share a common element, like these mercury glass candles sticks. I’ve been collecting them for several years now. They are really very reasonable and give a table a bit of bling! If you are having a smaller gathering or have a very long table, forgo the head chairs and seat everyone across from each other. I LOVE this seating arrangement. And when you do, s-t-r-e-t-c-h the centerpiece from one end of the table to the other. This tip has allowed me to set so many different tables. I love white plates. White dinner plates! 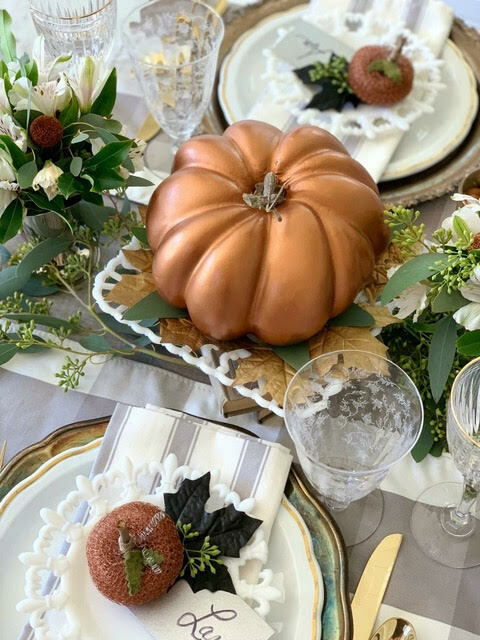 And because I mostly set a white table I can add some very interesting salad/dessert dishes or small bowls in different colors, designs or motifs to a table. So my dish closet has very few “dinner plates” and lots of really nice accent plates! I’ve used these white turkey salad plates for 5 years. 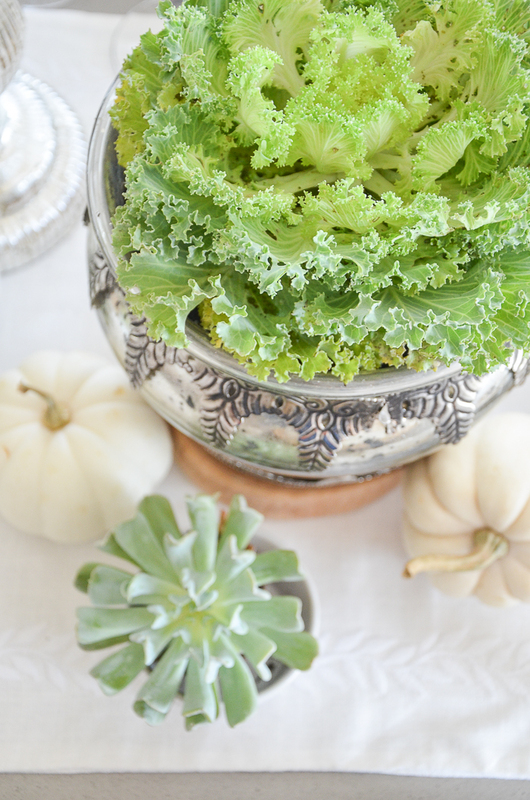 I do have a few other salad plates that would work nicely for a Thanksgiving table but I just love these little turkeys. 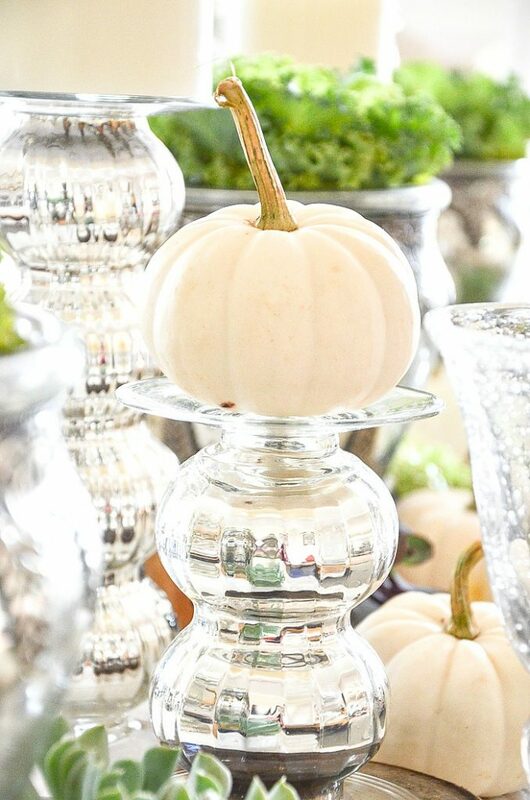 One of the beautiful things about setting a Thanksgiving table is the ability to use the best of the fall season as part of our decor! Celebrate it, and use it liberally! 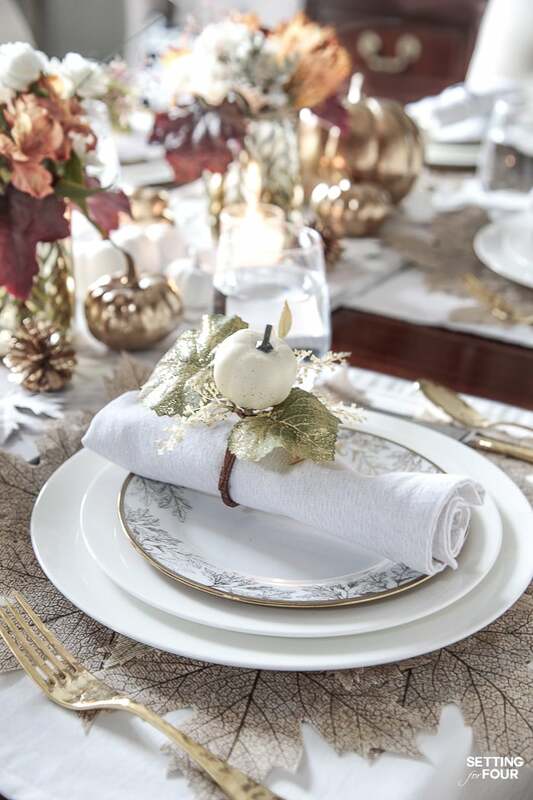 This is a good rule of thumb to follow: The more elaborate the centerpiece on your table is the simpler each place setting should be. And vice versa. 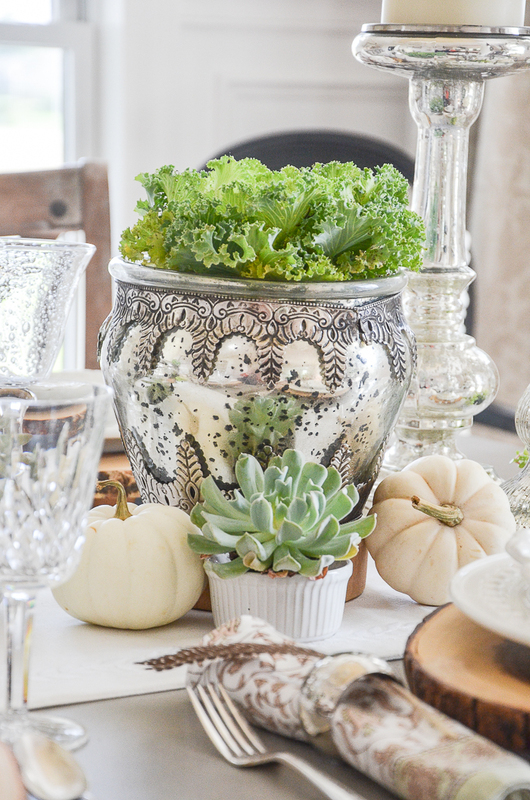 If you use this easy tablescaping formula it will help your table have balance! 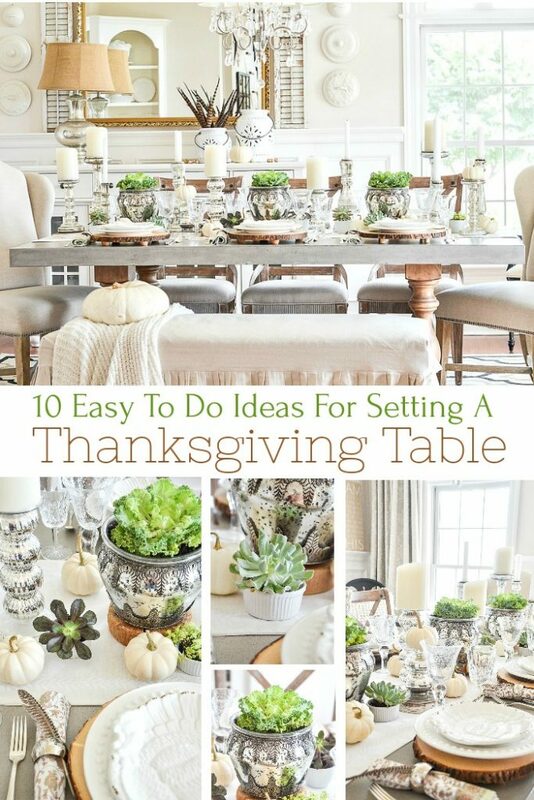 If you are setting a Thanksgiving table this year I hope these easy ideas have helped. Now you are in for a treat! I’m sending you over to my friend Sheila at MAISON DE CINQ and tell hherI said HI! 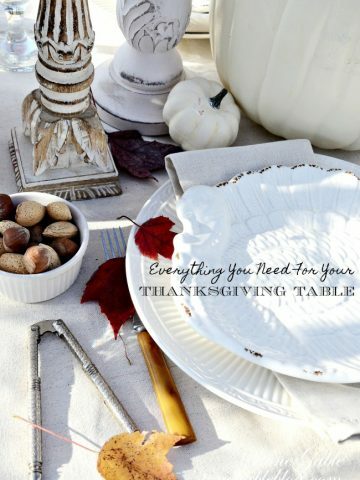 8 AMAZING IDEAS FOR THE BEST THANKSGIVING TABLE EVER! Great tips! I do have a question though, which is similar to one already asked. You mentioned that you put the food on your kitchen island. Do you stack the dinner plates on the island for guests to use or do you have guests take them directly from the already set table? It seems more practical for them to be next to where food is served, but then that ruins the pretty table display. Wonderful post, Yvonne, and fabulous tips! 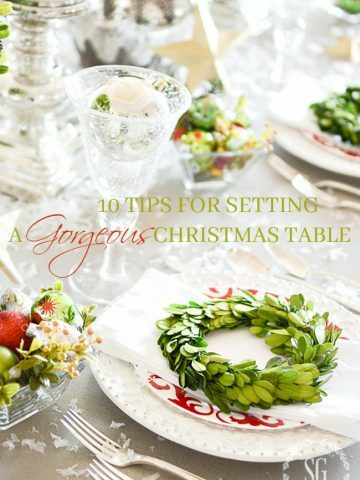 I’m going to incorporate a couple of the tips into one of my wee tablescapes. Just gorgeous! 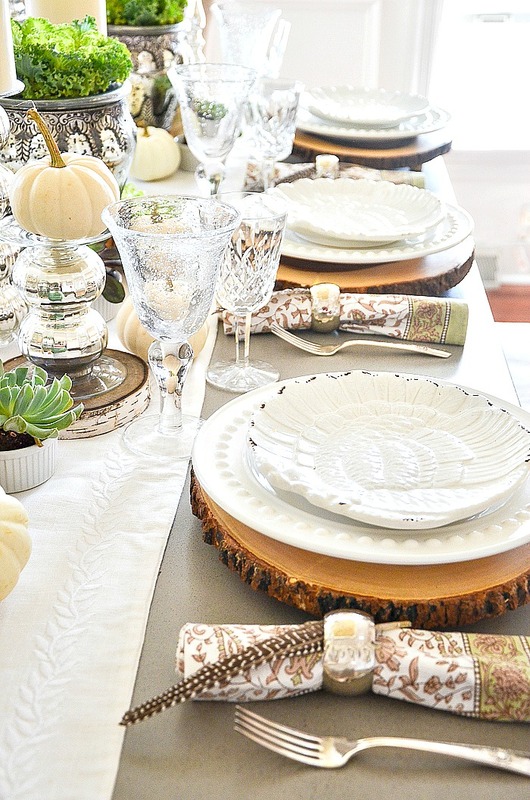 I love using all the natural elements on the table and the neutral color palette is beautiful! I need those turkey plates! 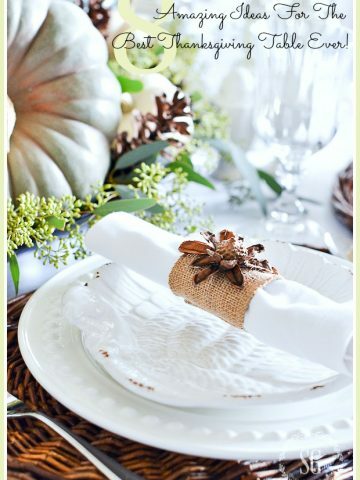 I feel a cloth is the canvas for a beautiful table setting. Some granite may not stain if the surface has been prepared properly, which has to be done periodical, marble and wood will definitely stain. I prefer the cloth, you get the feeling of the season from the canvas. Then add your beauties. Might I add your beauties always look great , cloth or bare. I love your blog and podcast!! It makes my day ❤️❤️❤️ I love your Thanksgiving tablescape and I’m obsessing over your white turkey plates. Any ideas of where to find them? Hi Janey, Sorry! I found them a few years ago at my local Pottery Barn and have not found them since. This is just beautiful BUT….. 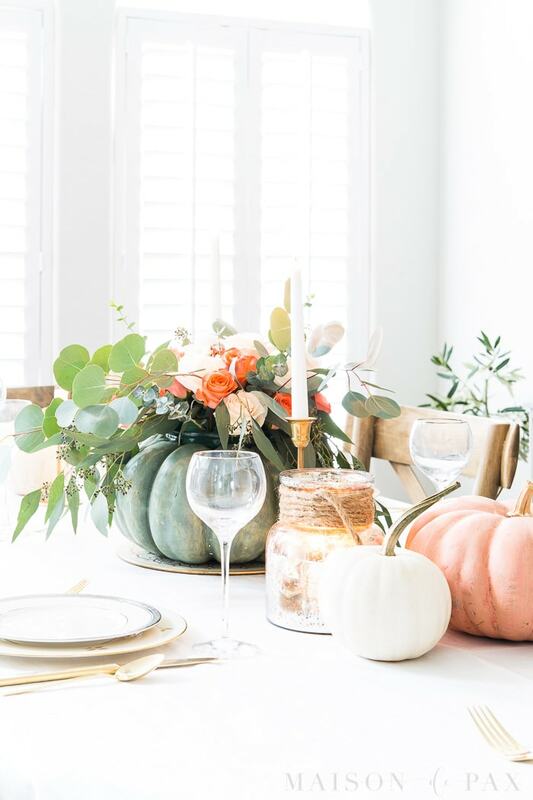 I would love some of my favorite bloggers to show us how they set their table with FOOD on it. ! What decor is left on the table when you have SO much food on it? Drinks where do those go so they don’t leave rings on your table. What do you use under your dishes so they also aren’t leaving marks on the table? PLEASE write about this.. We all have these issues ! Hi Loyda, I don’t set food on my table. I usually have a buffet on the kitchen island and a dessert bar on my buffet. I hope this helps. 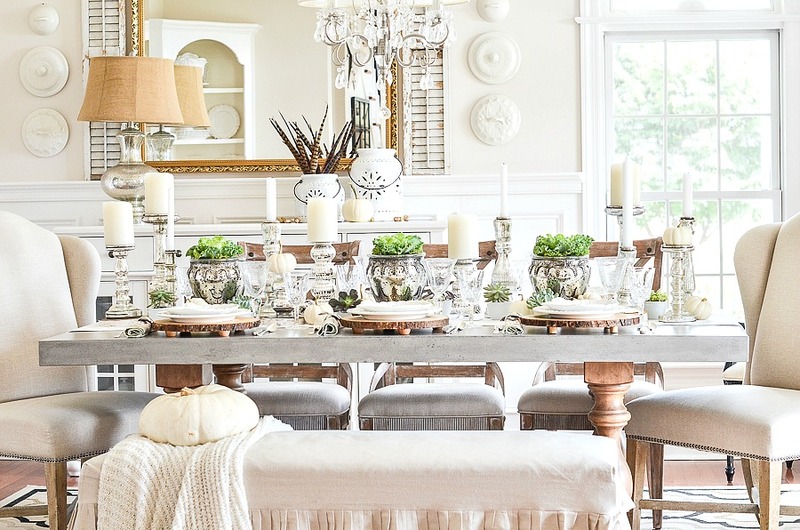 You always do such gorgeous tablescapes, and this one is no exception! 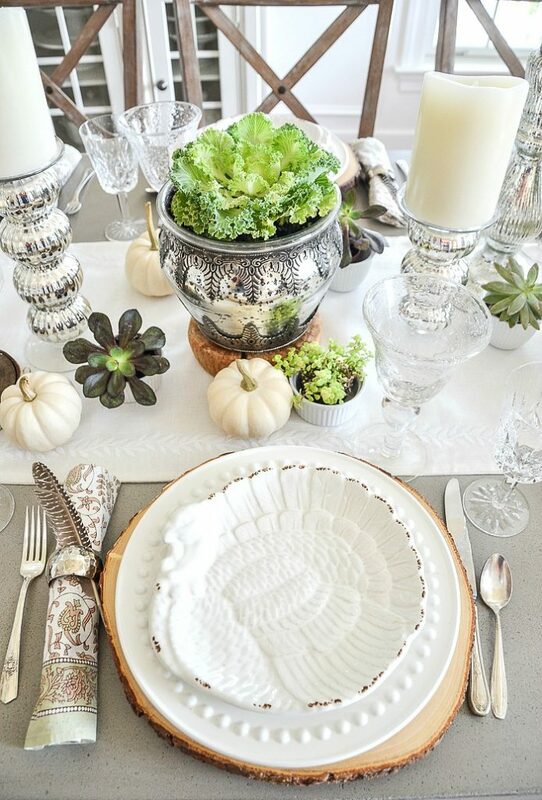 The mix of white and green is so up my alley, and how cute are your textured turkey salad plates? Love those! And I adore the cute napkins, too! So glad to be joining you again on this hop – and happy fall! Your table looks lovely,I especially like the turkey plates.Using white dishes is a great backdrop for everything.I just bought a new set of white dishes with a beaded rim and just love them.I mix them with yellow dishes in my black and white kitchen. 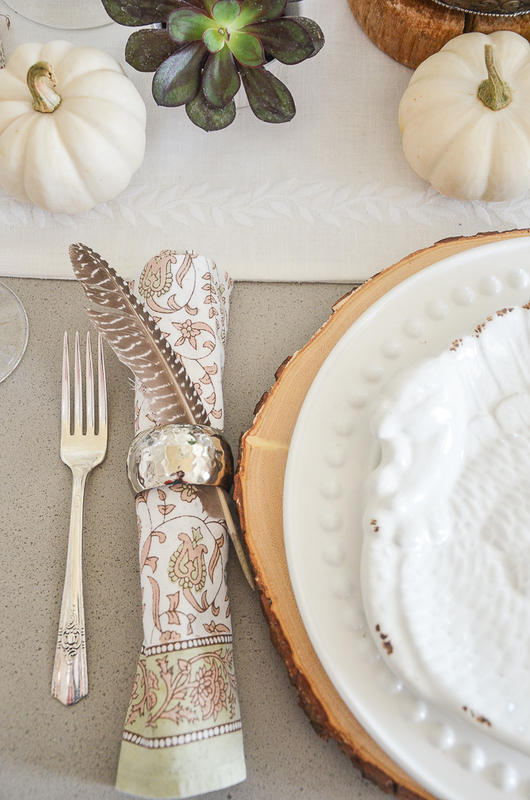 Love your blog and love your tablescape. Where did you get the footed wood chargers? Ones shown on your ‘buy’ link are pricey at $17 each. Thanks much!! Beautiful table! Just wondering where you got the mercury (?) glass pots for your cabbage in the center of your table? Just love them! Hi Janis, I found them a few years ago at the Pottery Barn.